Sugar Beach is an all-condo resort comprised of 3 stories of studio to 4Bdrm/4Bth units, all located directly on 1000 feet of groomed sandy beach, and each unit has a fully equipped kitchen, private balcony, spacious living and bedrooms. 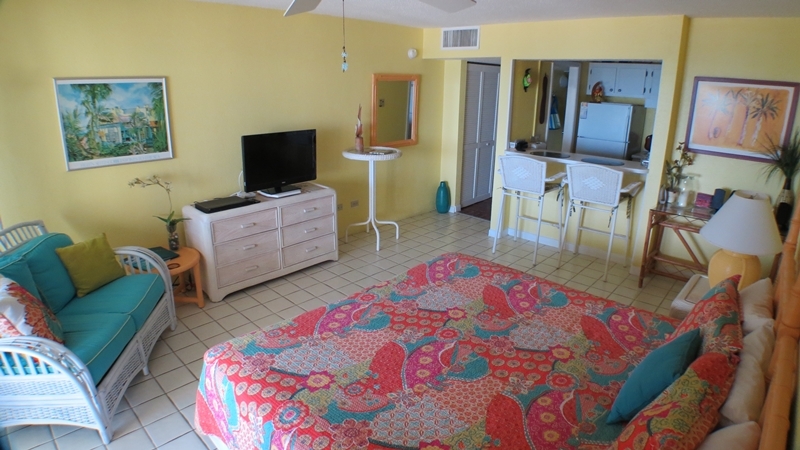 Each unit is fully stocked with linens, paper goods, and beach towels, and has central a/c and ceiling fans. Our 1DXL units and larger also have washers/dryers in the units. Guests in smaller units are welcome to use the public laundry facilities near our beautiful freeform fresh water swimming pool nestled around a 250 year old Sugar Mill ruin adjacent to our clubhouse which offers free internet services. Rated #1 on TripAdvisor.com since 2004.